The Minnesota Legislative Manuals, 1973-74 and 1975-76 list his birth date as May 7. The Minnesota Legislative Manuals, 1977-78, 1979-80, and 1981-82 list his birth date as May 6. He was a member of the Democratic-Farmer-Labor Party but switched to the Independent Republican Party on March 21, 1978. 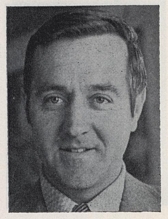 He ran unsuccessfully for the Independent Republican party endorsement for Governor of Minnesota in 1982. Religion provided by the St. Paul Pioneer Press, March 6, 1983. Leadership Notes: He resigned as Minority Leader in February 1982 in order to run for Governor of Minnesota. Party: Democratic-Farmer-Labor Party Notes: He switched to the Independent Republican Party on March 21, 1978. Session Notes: His margin of victory over M.K. "Dutch" Cragun was 202 votes.